2019 Topps Now Showtime Championship Boxing brings the action straight to collectors, and not very long after the fight takes place. Like most Topps Now sets, the card totals are limited to the number ordered during the selling period. This timeframe can be as little as 24 hours or up to several days. Regardless, once the countdown ends, the cards are forever retired. 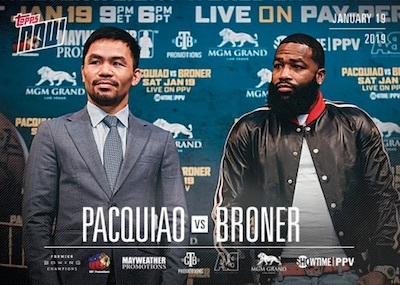 Building on the small, initial set from 2018, the 2019 Topps Now Showtime Championship Boxing options pick up with the welterweight world title fight between Manny "Pacman" Pacquiao vs Adrien "The Problem" Broner at the MGM Grand in Las Vegas on January 19, 2019. View available Topps Now Boxing cards on the Topps site. In addition to a base card release for $9.99, each fighter has an event-used ring mat relic card. Numbered to either 25 copies or one-of-one, the Pacquiao relic card sells for $49.99 ($499.99 for the 1/1), and the Broner relic card is priced at $39.99 ($399.99 for the 1/1). Check back for more details on 2019 Topps Now Showtime Championship Boxing as they are revealed. Print runs (PR) will be noted once known. Fight takes place on January 19, 2019. Buy Now Boxing cards on Topps. 2019 Topps NOW Showtime Championship Boxing PVB-1 Pacquiao Vs Broner SOLD OUT! !